U.S. Route 49 is a north–south United States highway. The highway's northern terminus is in Piggott, Arkansas, at an intersection with US Route 62/Highway 1/Highway 139 (US 62/AR 1/AR 139). Its southern terminus is in Gulfport, Mississippi, at an intersection with U.S. Route 90. US 49 is approximately 516 miles (830 km) in length. It was at the junction of US 49 and U.S. Route 61 that blues singer Robert Johnson is said to have sold his soul to the Devil. The highway is also the subject of songs by Big Joe Williams and Howlin' Wolf (Chester Arthur Burnett). U.S. Route 49 has historically been one of the most important highways in Mississippi. It was the state's first highway to see a significant rural segment four-laned. Today, it is the only four-laned route directly connecting Jackson, the state's capital and largest city, to the Mississippi Gulf Coast. Some urban segments along this portion of the route maintain three or more traffic lanes in each direction. Highway 49 serves as a primary hurricane evacuation route for Gulf Coast residents. The highway begins near the Port of Gulfport, Mississippi at a junction with U.S. Route 90. Highway 49 provides a major connection between the port, casinos, beaches and downtown with Interstate 10 on the city's north end. North of I-10, US 49 passes through suburban areas and enters De Soto National Forest. Various state highway interchanges and junctions are encountered before the route passes near Camp Shelby, then through an interchange with U.S. Route 98 just south of Hattiesburg. At this point, travelers have an option of continuing on U.S. 49 through Hattiesburg or using a U.S. 98 / Interstate 59 bypass which reconnects with 49 in the northern part of the city. Continuing on 49 brings one to the cloverleaf interchange at U.S. Route 11, one of very few in the South to lack merging lanes between loop ramps, thus altering the usual weaving patterns which plague many of these interchanges. U.S. 49 passes Hattiesburg's primary medical facility, Forrest General Hospital, and the campus of the University of Southern Mississippi before arriving at another, more standard cloverleaf interchange with Interstate 59. Suburban development is soon encountered as the road returns to rural environs. Interchanges between Hattiesburg and Jackson provide access to various state highways, and one at Collins provides access to U.S. Route 84. At Jackson, U.S. Highway 49 shares an alignment with segments of Interstates 20 and 220 before turning northwest to Yazoo City. A split in the highway, rare in the U.S. system, begins here, with both routes heading into the Mississippi Delta, U.S. 49W serving the towns of Belzoni and Indianola, where it junctions U.S. Route 82 and its four-lane segment ends, while two-laned 49E serves Tchula before encountering U.S. 82 at Greenwood. Both routes continue north from 82 and are linked again at Tutwiler, Mississippi. Continuing northwest, the highway passes through an interchange with U.S. Route 61 as it enters Clarksdale. 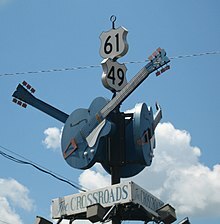 It is at Clarksdale that Highway 49 encounters "The Crossroads", the legendary junction with State Street (an old alignment of U.S. 61) where the great blues musician Robert Johnson is reputed to have sold his soul to the devil. From Clarksdale, Highway 49 continues north toward its crossing of the Mississippi River, where it enters Arkansas near the town of Helena. The legendary "Crossroads" at Clarksdale, Mississippi inspired the song Cross Road Blues. In May 2005 portions of extant Highway 49E were renamed the "Emmett Till Memorial Highway." The Mississippi section of U.S. 49 and the routes of U.S. 49E and 49W are defined at Mississippi Code Annotated § 65-3-3. US 49 enters Arkansas near Helena-West Helena in Phillips County. US 49 Business runs around the north part of the city, with the main route meeting AR 242 in the southern portion. US 49 continues west to Walnut Corner where the route meets AR 1 (and briefly AR 316). The US 49/AR 1 concurrency ends in Marvell, and US 49 enters Monroe County. Upon entering Monroe County, US 49 turns north to begin a concurrency with AR 39. US 49 also crosses US 79 before meeting US 70 near Brinkley. The route crosses Interstate 40 north of Brinkley prior to entering Woodruff County. US 49 runs northeast through rural Woodruff County, not crossing of concurring with any important routes before crossing into Cross County. The route meets US 64 in Fair Oaks, and meets AR 42 in southern Hickory Ridge. It then enters Poinsett County, concurring with AR 214 from Fisher until Waldenburg. The route crosses AR 14 in Waldenburg. US 49 runs along south Jonesboro, with US 49 Business formerly running into town. US 49 concurs with US 63 until again joining AR 1. The two routes angle north through downtown Jonesboro, crossing US 63 Business and passing by ASU Stadium before leaving town. US 49/AR 1 pass around Brookland, with US 49 Business serving the community. Entering Greene County, US 49/AR 1 briefly meets AR 358 before entering Paragould. The routes cross US 412 near Kirk Field in Paragould, also meeting AR 135 north of town. US 49 Business also rejoins US 49/AR 1 north of Paragould. Continuing northeast through rural Greene County, US 49/AR 1 meet AR 34 in Marmaduke and AR 90 in Rector. The route turns north to Piggott at Hargrave Corner, terminating at US 62/AR 139. The Arkansas portion of US 49 is mainly two-lane undivided. One of the original US highways, US 49 was extended north from Clarksdale, Mississippi to US 70 in Brinkley, Arkansas via U.S. Route 61 and Highway 6 in 1963. US 49 was again extended north in 1978, replacing Highway 39 between Brinkley and Jonesboro. Highway 1 between Jonesboro and Piggott was redesignated as US 49 in 1979. It is notable that for several years during the 1930s, a second split route existed on US 49 in South Mississippi, similar to but shorter than the split that still exists in the Delta region. Between Brooklyn and Hattiesburg, travelers had the option of a 24-mile-long (39 km) direct route via US 49W, or a somewhat shorter but broken route on US 49E, serving the small community of McCallum. The entire route is in Mississippi. ^ "U.S. Route Number Database" (Dec 2009 ed.). American Association of State Highway and Transportation Officials. Retrieved 2011-02-09. ^ "Emmett Till Museum Archived 2011-07-11 at the Wayback Machine." Village of Glendora. Retrieved on October 17, 2010. ^ "Minutes of the Meeting" (PDF). Arkansas State Highway Commission. March 20, 1963. pp. 903–904. Retrieved January 28, 2013. ^ "Minutes of the Meeting" (PDF). Arkansas State Highway Commission. April 26, 1978. pp. 269–270. Retrieved January 28, 2013. ^ "Minutes of the Meeting" (PDF). Arkansas State Highway Commission. April 25, 1979. p. 66. Retrieved January 28, 2013. ^ Planning and Research Division (2010). "Arkansas Road Log Database". Arkansas State Highway and Transportation Department. Archived from the original (ZIP) on 23 June 2011. Retrieved June 9, 2011. This page was last edited on 1 April 2019, at 04:13 (UTC).